Because machinery in the food industry must endure particularly harsh environments, SEW-Eurodrive has engineered a drive system built specifically to meet those challenges. Our Food Industry Specialist worked with customers to identify specific system requirements and enhancements necessary for the rigorous demands of the food industry, including damp conditions and chemical wash downs. The result is a customized drive system with specialized components to meet the needs of the food industry. 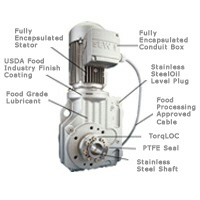 Purchase your SEW Eurodrive Food Industry Option Package today!